A facial mist is a bit of a luxury item. Spritzing your face with scented mists cant feel a little first-world, but actually is as beneficial as enjoyable. 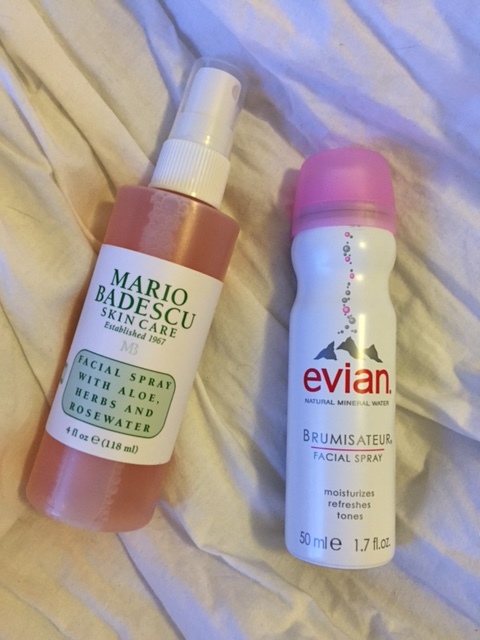 The Evian Facial Spray and Mario Badescu Rosewater Spray are both useful for this winter season that leaves your skin dry and often crusty (gross but true) at the end of the work day. If you’re traveling on a red eye or long flight, these products are also great to refresh yourself with every few hours or so. The Evian mist is a bit more fine, and covers your face in a more equal area. Use this guy for more serious skin issues. Bonus point: they also are sold in travel size at Sephora. The Mario Badescu option smells so delicious and rose gardenesque with a point and shoot nozzle … I’ve been using at the end of a long day, or first thing in the morning on my way out the door. Would you all try these mists? As a little incentive, Mario Badescu is offering up to 20% off online through today!